When the temperature drops, it's time to head into the kitchen and start cooking up all of our favorite comfort foods. Gooey baked pasta dishes, comforting soups, stews and hearty chiles oh, how I love fall and winter meals that warm you from the inside out. Nothing screams comfort food more than a hot bubbly cheesy casserole! 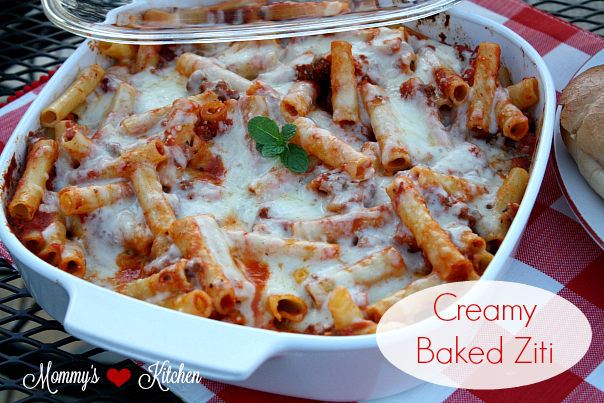 One of my favorite pasta casseroles is this Creamy Baked Ziti. It's similar to lasagna, but so much easier and less time consuming. Baked Ziti is a classic layered pasta dish made, with ziti pasta in a creamy tomato meat sauce and topped with mozzarella and Parmesan cheese. I prepare my baked ziti a little different than most. Instead of layering each of the ingredients I like to combine the sauce and the cream together and then pour it over the ziti noodles. Then gently mix the sauce mixture evenly with the pasta. 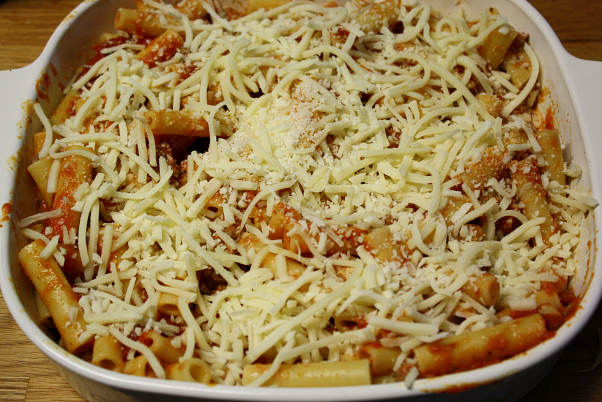 Transfer the pasta mixture to a greased baking dish and top with cheese. For me this method is much easier than assembling layer after layer which is too time consuming. 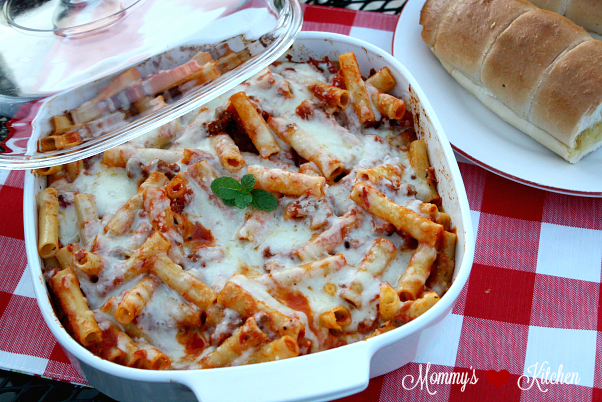 Baked Ziti is a great recipe for potlucks, get-togethers and family dinners. 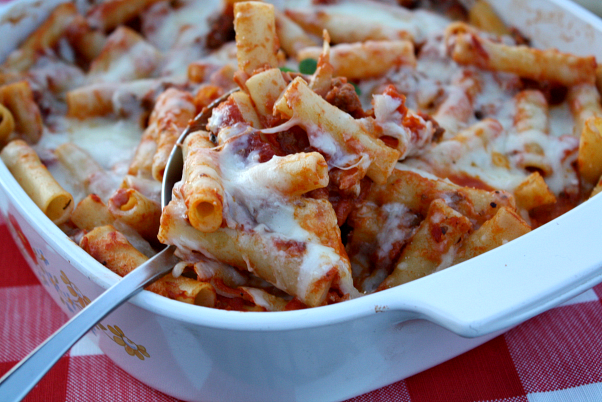 Baked ziti also makes a large amount, so it's perfect to feed a crowd. Just add a salad and some crusty bread and you'll have dinner on the table in no time. I served my baked ziti with a garden salad and a new Bake&Break™ Pull-Apart Garlic Loaf by New York Bakery®. If you love NewYork Texas Garlic Toast, then you're going to love these new pull apart garlic bread loaves. This new french bread comes in two varieties, garlic bread and garlic cheese. Each loaf bakes in just 5 minutes, with no cutting, no mess and easily pulls apart. No more messy crumbs on your counter or table. My family loves a good crusty bread with our meals, so I'm pretty excited about these new Bake&Break™ loaves. My son's favorite is the Texas garlic toast, so I was curious to see how he would like the new pull apart garlic breads. New York Bakery® sent me two loaves of bread and encouraged me to take the "Bake& Break™ Challenge to see how I liked their new garlic bread loaves. You can see from the photos above how much easier the new Bake&Break™ bread is versus a traditional crunchy bread. No more messy crumbs to clean up, no slicing and it's already coated with a delicious garlic butter. 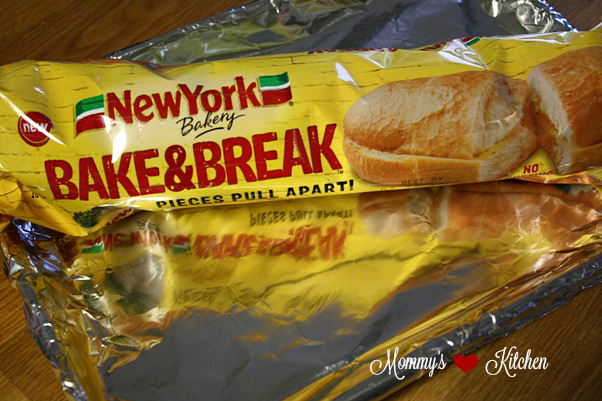 You can wrap the bread in foil for a softer loaf or bake the bread uncovered for a crispier bread. Now let's get started with the step by step directions for this easy pasta dish. Grease a 13 x 9 inch baking pan with nonstick spray and set aside. 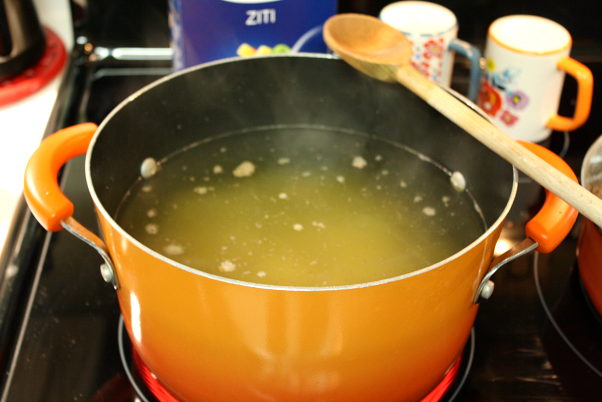 Cook ziti pasta in a large pot of salted water according to package directions until al dente (about 8 minutes). In a large skillet, brown onion, garlic and ground beef over medium heat (breaking the meat as it cooks). Drain off any grease. Add the garlic salt, onion powder, Italian seasoning, black pepper and salt to taste. Add the diced tomatoes, (I puree one can in my mini chopper before adding) tomato sauce and sugar. 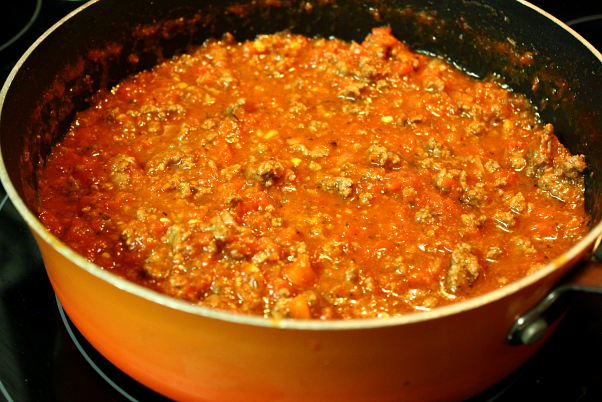 Bring the sauce to a boil, reduce heat and simmer for 20 - 30 minutes. Preheat oven to 350 degrees. Drain the pasta and add to a large bowl. Add the butter and toss until the butter is melted and coats the pasta. Add the sauce and cream to the pasta and gently mix to combine. Transfer the pasta mixture to prepared dish. Sprinkle the shredded cheese evenly over the top. There is no rule on the cheese, so more or less can be added. Cover with foil (sprayed with non stick spray) and bake for 20 minutes. Remove foil and bake for an additional 10 minutes or until bubbly and the cheese is melted. Add the garlic salt, onion powder, Italian seasoning, black pepper and salt to taste. Add the diced tomatoes (I puree one can in my mini chopper before adding), tomato sauce and sugar. Bring the sauce to a boil, reduce heat and simmer for 20 - 30 minutes. Transfer the pasta mixture to prepared dish. Sprinkle the shredded cheese evenly over the top. There is no rule on the amount of cheese, so more or less can be added. Remove from oven and cool slightly before serving. Serve with a garden salad and garlic bread. Cook's Note: This dish can easily be made into a meatless meal. If the ground beef is not added, saute the onion and fresh garlic in one tablespoon of olive oil and continue with the recipe. Two 8 x 8 size casseroles also be made instead of one 13 x 9 inch. This is a great idea, so you can have a second casserole on hand for another meal. Freezing Instructions: Assemble casserole and freeze unbaked. Cover casserole with 2 sheets of aluminum foil, label, date and freeze. When ready to bake, remove casserole from freezer and thaw completely. Preheat oven to 350 degrees and bake for 20 -25 minutes covered with one sheet of aluminum foil. Remove foil and bake casserole an additional 10 minutes until casserole is bubbly and cheese is melted. For more information visit, NewYork Bakery® and follow along on Facebook and Pinterest. This is a sponsored conversation written by me on behalf of New York® Bakery. The opinions and text are all mine. 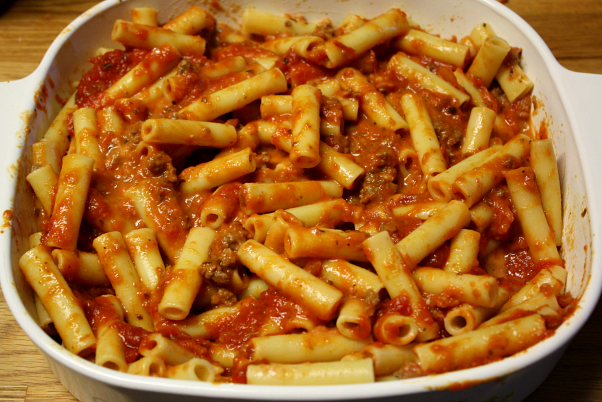 Oh my goodness that baked ziti looks amazing. I need to make this soon! Looks like it would be good on a cold day. That break apart bread looks yummy too! Thank you!